The framework for American Hustle's story is this: Irving Rosenfeld (Christian Bale) is a con-man who owns a small chain of dry cleaners and deals some counterfeit art on the side. He also runs a phony loan scheme. Sydney Prosser (Amy Adams) enters his life when they both attend the same party and connect over their mutual love of Duke Ellington. Eventually Irving tells Sydney the truth and asks her to join in on his scheme. To his surprise, she accepts his offer and creates the identity of a British woman with royal lineage and banking connections in London. Together they scheme enough people to pop up on FBI agent Richie DiMaso's (Bradley Cooper) radar. He actually busts them then offers immunity in exchange for their help in exposing other con artists. Richie is overzealous and the initial operation snowballs into something much bigger than any of them planned, extending into the world of politics and and even the mob, sucking NJ Mayor Carmine Polito (Jeremy Renner), and Irving's wife Rosalyn (Jennifer Lawrence) into things in the process. There are too many intricacies, twists and turns in American Hustle to discuss in more detail without spoiling things, but I can say this: I'm not even sure I followed all of the cons that were in play or if the characters carrying them out were even doing it consciously or not. The notion that one could manipulate things in their favor despite all of the variables that pop up is as ludicrous as Irving's comb-over or how little Sydney's clothing covers. For the second year in a row, David O. Russell has directed one of the most entertaining films of the year. 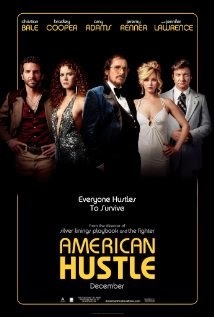 Much like last year's Silver Linings Playbook, the characterizations and their interactions with one another are what really drive American Hustle. Christian Bale's and Amy Adams' performances are excellent. Bale transformed his body once again proving that there isn't much of anything he can't do. And Adams' ability to pick up and drop Sydney's British accent as she moves in and out of character is unbelievable. Jennifer Lawrence added her usual unique charm and there are fun smaller roles turned in by Louis C.K. (as Richie's supervisor Stoddard Thorsen) and Robert DiNero (as a mob boss). I hesitate to label this as 'fun' because I think that almost doesn't give it enough credit. There's much more to it than that, but when it's all said and done, that's what we have, a fun film that will most likely garner a hand full of Oscar nominations to go along with the seven Golden Globe nominations that it has already received. - I liked the thread of Thorsen trying to tell Richie the ice fishing story throughout the film. Richie kept cutting him off and guessing as to what the point was. It helped show just how impatient Richie is. The only thing is that we never got to hear the end of it, which I was looking forward to since the story kept coming up. - It was amusing how the political personality that they picked to shed light on corruption - Polito - really wasn't corrupt at all. At least not until he got sucked into the scheme. - I have no idea if Rosalyn was another master-level con artist like Irving said during his internal monologue or if she was crazy and had to take credit for everything to make herself feel better about a situation. That's part of the brilliance of Jennifer Lawrence's performance. One minute her actions seem deliberate and another they seem overemotional. - This film may have the craziest assortment of hairdo's in quite some time - or at least in my recent memory. - While it is rated R, the film as a whole isn't as sexed up as the trailer would make it appear. Awesome review Tim. I've been wanting to see this one as well. Especially after seeing Silver Linings Playbook not too long ago. Each actor in this film are ones that I absolutely love to watch. If this is anything like Silver Lining (except for the con-man story aspect) I will definitely see this one. Maybe not in theaters but definitely when it is out on dvd. Unless you think it should be seen on the big screen? Thank you sir! I wouldn't say that this is a film that necessarily warrants the theater experience. It really just depends on how patient you are. If you don't mind waiting for the DVD/blu-ray you won't be missing out at all. It isn't like an Avatar or Dark Knight that has that extra sense of awe from being on the big screen. Everybody here is on their game, especially Cooper who, in a perfect world, would be looking at an Oscar nomination this year. I can only hope though. Nice review Tim. Thanks for the kind words! I agree about Cooper. I think this film will rack up a number of nominations. It'll be interesting to see where they fall though.